At the end of last month, we caught up with Kiersten White at her book launch for the final volume in her Paranormalcy trilogy, Endlessly. What a fun event at the Barnes and Noble in Oceanside, California! 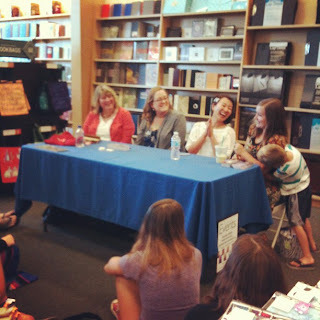 Not only did we get to see Kiersten, but we also got to interview Cynthia Hand, Marie Lu, and Robin LeFevers. And our teen correspondent, Ava, joined us for this interview, so it was extra fun! We talked to Kiersten about what it was like to wrap up Evie's story and what future projects she's got brewing. Then all of the authors answered some awesome questions from our podcast listeners, including a particularly interesting discussion of how they write strong female characters. We also have our "Picks of the Month". This month, our picks are the Pittacus Lore series (I Am Number Four, The Power of Six and The Rise of Nine - stay tuned for a giveaway of this series!) and Dark Unwinding by Sharon Cameron. The fabulous author panel + adorable kiddo hug for Kiersten. BONUS: It's giveaway time! We have an autographed ARC of Endlessly to give away to one lucky listener. Leave us a comment after listening to this episode and tell us which one of Kiersten's many upcoming projects you're MOST looking forward to. (There are a few to choose from!) Be sure to leave your email in your comment so we can contact the winner. Contest is open to US residents only. Deadline to enter the contest is August 27th. I freaking LOVE Kiersten White and cannot WAIT to read Endlessly. Plus Mind Games. Um, hello, I'm a sucker for a good creepy boarding school book. This podcast got me excited for all Kiersten's new stuff. Wooohoo! thanks for another great interview. Just dropped you an email. We ended up having to choose a new winner and that winner... is YOU! :D Thanks to random.org for helping us out. i cant wait to read ENDLESSLY! love finding new books to read!!!!!!! THANKS! I liked the idea that was proposed about a woman being powerless, and with that motivation of finding that power. Thanks for all your great comments, everyone! Enna, I so agree, the conversation about female empowerment in this interview was really fascinating. I love each author's take on the subject! I cannot wait for Mind Games!! Just seeing the cover was enough to make me need it, but after reading about it, I need it even more! Thanks for the awesome podcast : ) Love learning about new books! Hi Alicia! You forgot to provide your e-mail address and you just won the giveaway! Can you please e-mail me at michelle (at) authorsarerockstars (dot) com with your info so that I can mail Endlessly to you? Alicia, we still have not heard from you. Please respond by the end of the day (Thursday August 30th) or we'll have to select a new winner.